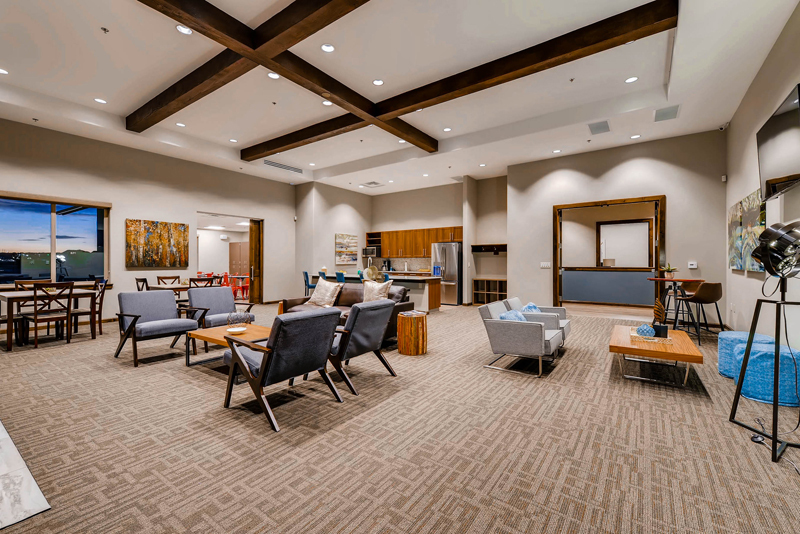 Commanding center stage in Stonebridge is the Lodge, a private clubhouse exclusively for Stonebridge residents. This getaway offers endless life-enriching possibilities. Get in a workout in the fitness room. Maybe a gourmet cooking class in the kitchen. A party on the patio or club meeting in one of multiple gathering rooms. A game of cards or pool in the retreat. Or a scrapbooking group in the craft room. Lucky you. If you live at Stonebridge, the place is all yours! While Stonebridge residents enjoy exclusive community perks, they can also access everything Meridian Ranch has to offer. Rounds of golf at Antler Creek Golf Course. Dining out with friends at Schafer’s Steakhouse at CreekView Grill. Pool parties and basketball games at the Meridian Ranch community center. A night of music during our concerts in the park. Play dates at the parks and hikes on seemingly endless community trails with Pikes Peak views. Children within Meridian Ranch can attend a Falcon School District 49 elementary school and high school right in the neighborhood. And with shops, restaurants, the airport and military bases conveniently close, life at Stonebridge becomes beautifully simplified. Leaving more time for the things that matter most. Priced from the low-$300’s, Stonebridge homes offer easy living and great entertaining. With some of the best home builders in the area, Campbell Homes, CreekStone Homes, Covington Homes and Richmond American Homes, you are sure to find the home that fits your family. Now open is the newest addition to Stonebridge, 164 homesites at View Point at Stonebridge, offering larger homesites with tremendous open space and mountain views, main floor living as well as walk-out lots. Hurry to pick the best homesite for your dream home. For a limited time, Stonebridge homebuyers will receive two free one-year prime memberships at Antler Creek Golf Course. Ask a sales associate for details.